Create a new document (File -> New), 500X250 pixels. Fill the background with black colour. 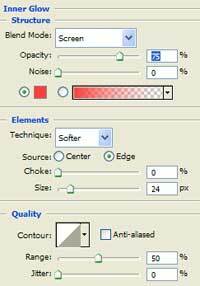 Create a new layer, call it ‘gradient’, select your Rectangular Marquee Tool and make a rectangular shape. 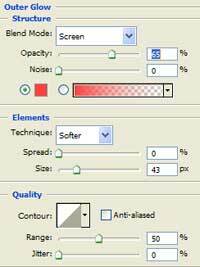 Choose the gradient tool and use it to create a Linear Gradient from left to right. Create a new layer, call it ‘oval’, using the Elliptical Marquee Tool create an oval shape. Fill it with red colour #FB0712. Load selection from ‘gradient’ layer (Ctrl+click on the layer icon), select inverse (Shift+Ctrl+I), go to ‘oval’ layer, delete. Create a new layer, call it ‘highlight’. Take your white brush and make a little line for highlight. Go to Layer -> New -> Group; call it ‘red’. Move ‘gradient’, ‘oval’ and ‘highlight’ layers into group ‘red’. Select group ‘red’ in layers palette, go to Layer -> Duplicate Group; name it ‘yellow’. While ‘yellow’ group is still selected, use Move Tool to move the content of the ‘yellow’ group to the left. Fill ‘oval’ layer in ‘yellow’ group with #FDE51E colour. Change Outer Glow colour to #FDE51E, and Inner Glow colour to #FDEF7A. Select goroup ‘red’ in layers palette, go to Layer -> Duplicate Group; name it ‘blue’. Move ‘blue’ group to the right. Change Outer Glow colour to #3644FA, and Inner Glow colour to #1A2AFC. Select goroup ‘blue’ in layers palette, go to Layer -> Duplicate Group; name it ‘green’. Move ‘green’ group further to the right. Change Outer Glow colour to #23A805, and Inner Glow colour to #23A805. Create a new layer, call it ‘wire’. Choose a hard brush, size 10 px, foreground colour #024E12 and paint the wire. Load selection from ‘wire’ layer, go to Select -> Modify -> Contract 2 px; then Select -> Feather 2 px. A add a layer style: Pattern Overlay; select the Herringbone pattern. Move and rotate lights against the wire. Open the file in Image Ready. Selected the layer with the yellow light. Open your animation panel (Window -> Animation). Set the Delay od the first frame to 0.5 sec. Go to the other layers and disable the layer effects (by clicking on the eye). Select the layer with the red light. Enable the layer effects of this one and disable the layer effects of the other layers. Do the same thing with the blue and the green light. Go to File > Save Optimized As… and save the file as a gif. 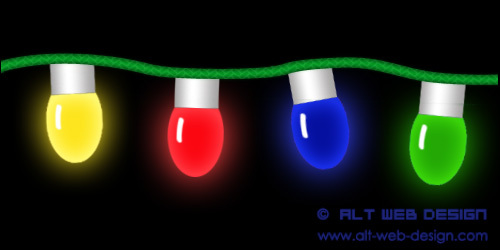 You have your animated christmas lights! hi, i was trying this out but when i copied the red layer into a yellow layer and tried filling the shape layer with yellow, it didn’t come out as smooth as yours. what should i do? thanks! In the ‘yellow’ group of layers, click on the ‘oval’ layer in the Layers Palette while holding Ctrl key in order to make a selection. Fill the selected area with yellow colour. Thank you. You make this look so easy. I like the effect of the lights going on and off. I changed the shape of the bulb, lost the black background and the blinking effect, and added some lens flares. I also blurred the highlight slightly. Works a treat for what I needed.